Don Sineti, folksinger, songwriter, part-time sea chanteyman at historic Mystic Seaport Museum (with one of the most powerful voices on the Eastern Seaboard! ), and long-neck, 5-string banjo picker , is also an award-winning marine mammal illustrator with a number of prestigious exhibitions and books to his credit. 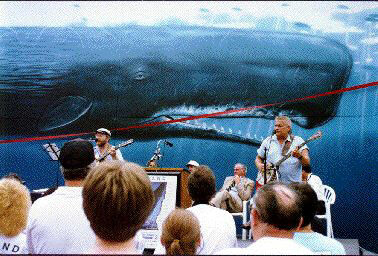 For over twenty years, he has combined his exhaustive knowledge of cetaceans (whales, dolphins, and porpoises) with his boundless energy, to deliver rousing renditions of songs from the days of wooden ships and iron men, alongside his own compositions dedicated to saving whales and the degraded marine environment.